Can you believe that we've reached the end of August? It seems like I was just complaining about June coming to an end. Time baffles me. Constantly. I mean, forget the fact that summer flew by like a favourite song (the one you were so excited to find playing, only to discover that it was already half-over). Oh, wait...that's it. That's summer. A song I'm endlessly humming in my head, but never quite tuned into. I always look forward to summer, but I'm never ready for her arrival. Thankfully, this August is not just functional, but also unique. It comes with a blue moon and one of my new favourite cookie recipes. Sift the flour and cocoa powder into a large mixing bowl. Add the baking Soda and salt. Whisk everything together and set aside. In the bowl of a stand mixer, fitted with the paddle attachment, beat the butter, peanut butter, and both sugars together until well-combined and smooth. (About 3-5 minutes on med-high speed.) Add the eggs one at a time, beating for about 1 minute per egg. Add the vanilla and for another minute or two. Add the flour/cocoa mixture and beat on low speed until just combined. Using a large wooden spoon or rubber spatula, fold in the chocolate and peanut butter chips until they're evenly dispersed throughout the dough. When you're ready to bake, preheat the oven to 350 F. Line baking sheets with parchment paper. Remove the sheet from the oven and allow the cookies to rest for about 10 minutes before carefully transferring them to a cooling rack. I feel the same way about summer - and winter...I do like that late summer / early autumn season, though. Not just because it's my birthday season, it's also the time I call melancholia - hehe. I like feeling a bit sad about the summer past - reminiscing all the good things that happened in the summer...So, it's a good kind of melancholy. Hehehe. Double doses of chocolate and PB is the perfect melancholic indulgence :) It makes me happy. Does that even make sense? it is kinda sad, isn't it? the passing of summer... but look fwd, friend, because the arrival of autumn is close at hand. plus, these cookies make it a smidge easier to take. 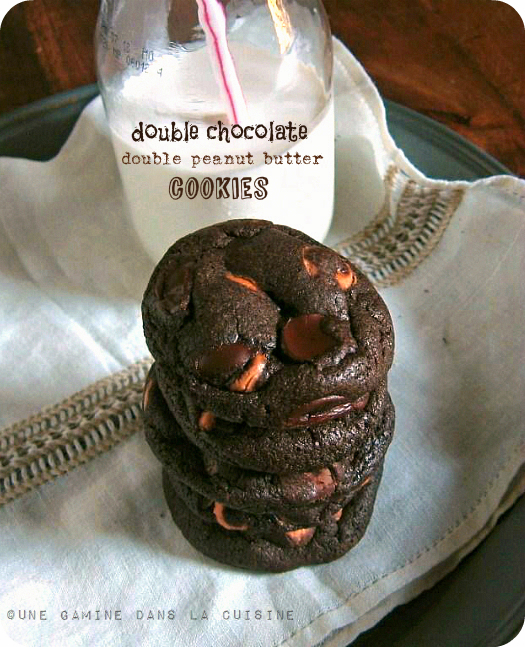 You had me at double chocolate and double peanut butter :). Sinful! Those cookies are just terribly tempting. Your cookies and your photos are really stunning! 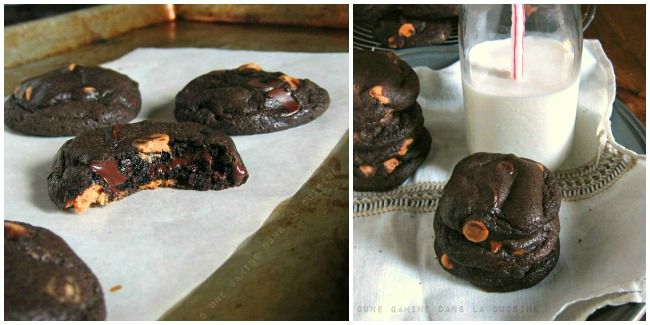 Oh, yes, I will absolutely be making these cookies! These are right up my alley, and they look positively wonderful. Yum! Jotting down the recipe now... :) Thank you for sharing! Time flies. Remember how long it took for 4 years of high school to end? I'm a little afraid of how fast it moves now, but I guess I like the seasons changing quickly before I can get sick of them. 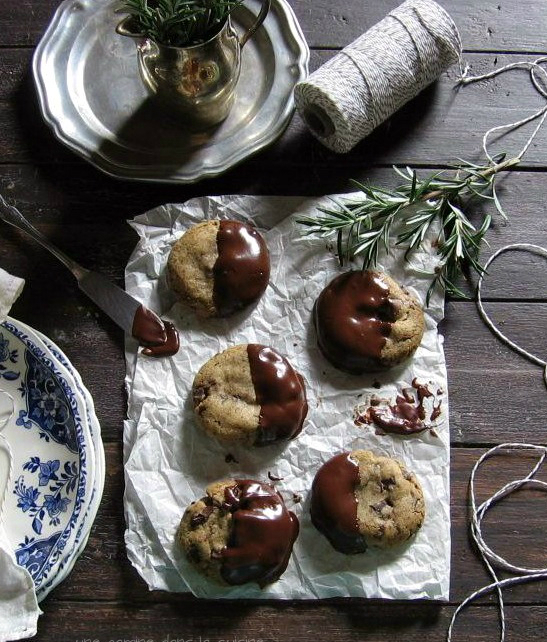 These cookies are totally decadent. I don't know where summer went either! And no one wants to help figure it out! I have a feeling that no one really knows. It's best to change the subject and discuss something we can touch, like these beguiling chocolate cookies. Just robust enough to usher in the first days of fall, whispering that change is in the air! These look amazing! I'm going to have to bake these ASAP! Love the picture with the gooey chips inside, and love the new blog layout! Double chocolate AND double peanut butter? My girls will be all over these cookies. I spent all of August writing my 15,000 word dissertation, so I can't say time flew by at all. But yes, can't believe we're in the last quarter of 2012! 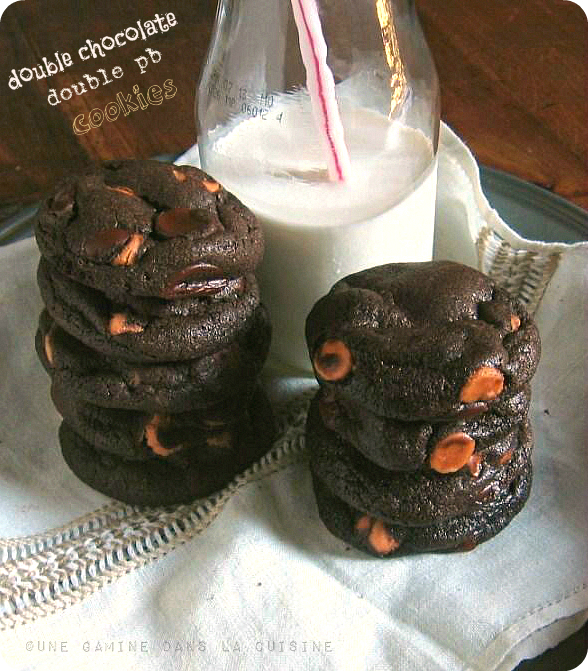 Double chocolate + double peanut butter?? Be still my heart!!! Brilliant!! I'm loving the summer, we get it late here on the San Diego coast, and I don't want it to leave. 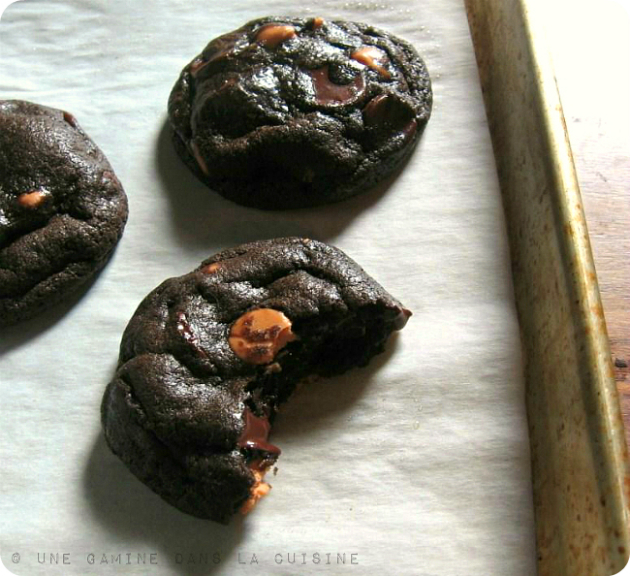 I'm savoring every last minute, but it would be even better with these cookies! These have all the ingredients to make a mean cookie. Great flavour combinations. Oooh, I can't wait to try these, they look stunning! Cookies always make me happy, and peanut butter and chocolate = extra happy! Oh my goodness, these were SOO GOOD!! I made a batch of these as a treat for the kids at Sunday school. Surprisingly, the kids seemed to double that day and I only had enough cookies to give each kid one cookie :/. After passing out the cookies, I walked outside and saw some of the kids literally licking the smudged chocolate and peanut butter from their ziplock bag. Everyone (including my family) LOVED it. Thanks for the recipe!! To say this one is definitely a keeper would be an understatement. Can't believe I've never seen these on your site before - stunning! Double of two of my fave things: choc and PB. 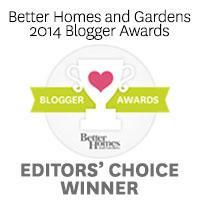 Winner, winner! I just finished making these. I refrigerated them overnight and rolled them into small balls, but they did not flatten out at all. The next batch I pressed flat and they cooked just fine. They tasted wonderful, they just don't look much like the photo (the photo shows much darker and somewhat shiny cookies). I'm not sure what I didn't do correctly. Still, they do taste amazing. I love peanut butter and I love chocolate. Thanks for the recipe! I love your blog. My cookies never look like the photos I see on other sites - even when I make the same recipe they sometimes look different. I think cookies are just fickle. :) I'm happy they still tasted great! Do you know why they didn't flatten out on their own and just stayed in balls when I cooked them? I used a knife for my flour measurements to top off the cups, so I was pretty confident in that. My baking soda is a bit old and I used chunky peanut butter rather than smooth. I also have a baking stone in my oven where I put everything on. Would any of those reasons have been the problem? Thanks for your response. Once I finish these, I'm going to do the oatmeal, chocolate chip, peanut butter cookies. I am really loving your blog. I have made the cream cheese chocolate chip cookies and those were fantastic. I have been sharing that recipe and others love them as well. Hi, Adele. So glad you (and your niece) are fans of the cream cheese chocolate chip cookies!